Note: I am a proud Amazon affiliate and am happy to recommend their service and products to you in this post. Please know that as an affiliate, I may receive a small commission on the products you purchase after clicking through my links. For more info, please see my disclosure policyhere. You know how you plan things out and later are so thankful for your planning? Well, this gluten-free dairy-free cake recipe roundup has come at the perfect time. My son just celebrated his birthday a couple days ago, and usually every year I scramble to figure out whether I should try to make a gluten-free dairy-free version, a normal cake with all the flour, milk, and butter, or even just forgo all that effort entirely and buy one from the grocery store. This year, it’s kind of just worked out that I spent the last few weeks rounding up some of the very best cakes around the internet to share with you and I’ll tell you what, I’m so grateful that I did this work in advance, because it’s become a pretty handy resource. 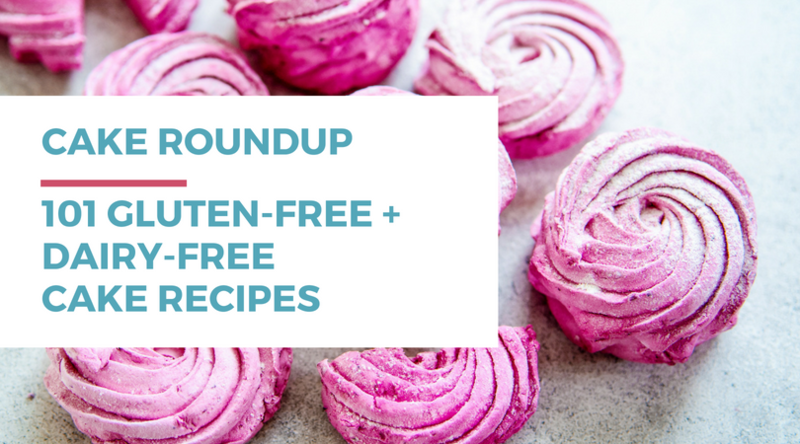 Not only are the cakes I’ve included in this roundup gluten-free and dairy-free, but many of them are paleo-friendly and even refined sugar-free. I’ve hand-selected each and every recipe in this roundup and made notes for you on substitutions (if any) that you’ll need. I hope it becomes an insanely useful resource for you as well. Inside this gluten-free dairy-free cake recipe roundup, you’ll find 10 different categories: vanilla, chocolate, birthday, yellow, carrot, nut-free, egg-free, lemon, red velvet cakes – plus my 10th category is dedicated to the frostings you’ll need to finish them off. There are some insanely delicious looking cakes in here – so I highly recommend looking through them all! Finally, I’ve gone through all the recipes and did a “top 10” for the tools and ingredients you’ll need to make some of these cakes come together – I know I found this useful (and even ordered a couple things while I was writing this post for you! ), I hope you do too. Without further introduction, here are 101 gluten-free dairy-free cake recipes hand-picked for you. These vanilla bean cupcakes are truly delicious looking. Made with vanilla bean paste for a big vanilla flavor, gluten-free flour, and dairy-free milk, this one is perfect for birthday parties, baby showers, and any other special occassion. Chrystal from Gluten-free Palate even offers trouble-shooting advice for making sure these turn out just right. This classic vanilla cake is a wonderful new take on an old favorite. With gluten-free flour, you can be sure to stick with your dietary needs. Just note that you’ll need to swap out the butter for vegan butter or coconut oil, and make your own dairy-free buttermilk using coconut milk and a bit of apple cider vinegar. This vanilla cake recipe is an excellent addition to your recipe book. It’s a great base for any kind of frosting or fillings you want to add to it, and since it’s gluten-free and dairy-free, you won’t need to worry about any substitutions – just follow the recipe as is. This simple vanilla sponge cake gets a big thumbs up from me! With only 8 ingredients, and no dairy-free alternatives, you can get a cake to the table without having to purchase any specialty ingredients. With gluten-free flour and a few other pantry staples, this one will be easy to whip up any time you need a dessert. This recipe is awesome, because not only is it gluten-free and dairy-free, but it’s free from the other top allergens. You can feel good about bringing it out to events where everyone seems to have their own dietary restrictions. Even better, they’re ready in just about 30 minutes! This vanilla cake is probably the closest to a whole foods-based recipe that I’ve ever seen. Using just eggs, raw honey, coconut flour, almond flour, baking powder, salt, and the seeds from one vanilla pod – this lovely cake doesn’t take much to make “bland” vanilla become something amazing – and dare I say it, even healthy! This grain-free vegan vanilla cake is made with almond flour, potato starch, and aquafaba (the liquid from canned chickpeas) among other pantry staples you’re bound to have in your kitchen. While some recipes are okay to swap ingredients, this one is pretty critical to stick to the ratios and weights laid out in the recipe to get the proper taste and texture. This cake is called crazy, because it’s made without eggs or butter – some of the main ingredients you usually find in cake. This one works out for us gluten-free and dairy-free folks though, just use gluten-free flour and you’re set with this tasty vanilla cake using just a few ingredients. These vanilla cupcakes are light and fluffy, plus happen to be gluten-free and dairy-free! These are kid-approved as per Michele of Paleo Running Mama, and perfect for birthday parties and special events. These vanilla paleo cupcakes are unique in that they use coconut flour instead of regular or a gluten-free flour blend. Lori from Health Extremist tried to get a great tasting vanilla cupcake recipe down – and after a few tries, she came up with this delicious winner! This light and fluffy vanilla cake is dairy-free and can be made gluten-free by swapping out the flour for gluten-free 1:1 flour blend. This chocolate layer cake with chocolate ganache looks amazing, and is gluten-free, dairy-free, and refined sugar-free. What could be better! Made with almond flour, cocoa powder, baking soda, salt, eggs, maple syrup, water, and vanilla – this one only takes a few ingredients to make this tasty treat. This allergy-friendly chocolate cake has no gluten, eggs, or dairy which makes it a win all around. If you think adding vinegar to a cake seems weird, not to worry, it’s just there to help the cake rise and you won’t taste any vinegar at all. This adorable cake can be made in two ways – a higher cake with 4 layers or a standard two-layer cake. This recipe has coconut flour and pumpkin, so even if it seems a little different – you know it’s going to be healthier than your standard chocolate cake. I don’t know about you, but I could always use another reason to love eating cake. This tasty paleo chocolate cake is gluten-free and dairy-free, has two delicious layers or chocolate cake and a dairy-free sweetened condensed milk and raw cacao powder chocolate ganache. You’re going to love this one! When someone can promise me chocolate cake without eggs, butter, sugar, or bowls… I can get on board with that quickly! Just be sure to use gluten-free flour blend instead of all-purpose flour to ensure it’s 100% gluten-free and dairy-free. If you love the combination of chocolate and mint, you’re going to love these gluten-free and vegan mint chocolate chip cupcakes. A delicious gluten-free dairy-free chocolate cake is the base and dairy-free mint chocolate chip buttercream is the frosting. These look so delicious – and I know my husband who loves mint chocolate chip ice cream will love these! This flourless chocolate cake has shown up on my Pinterest feed for months – and it’s about time I shared it with you. This super chocolatey cake is fudgy, gluten-free, dairy-free, and easy to whip up any night of the week. This paleo chocolate cake promises to be light, fluffy, and airy – as well as rich, decadent, and moist. 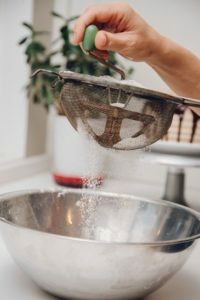 Be sure you have on hand these three gluten-free lfours to whip up this tasty treat: almond flour, tapioca flour, and coconut flour. If you love cake, but are a little more lazy like I am – this paleo chocolate sheet cake is for you! This recipe is made with coconut flour, coconut sugar, cocoa powder, coconut oil, eggs, baking soda, baking powder, sea salt, and coconut milk. Even the frosting is simple – with just 3 ingredients (canned coconut milk, chocolate chips, and sea salt). I know many of you who read my blog also follow the Low FODMAP diet, so this one’s for you! Just be sure to swap out the butter for vegan butter. Funfetti cake used to be my all-time favorite cake when I was a kid, so this gluten-free dairy-free version is a wonderful find! You can get the same taste without the gluten by using gluten-free flour, canned coconut milk, eggs, vegan butter, and a few other pantry staples. Don’t forget to top your cake with loads of sprinkles! This gluten-free dairy-free funfetti cake is a delicious white cake filled with colorful sprinkles and tasty dairy-free frosting. Just be sure to use a gluten-free flour blend without xanthan gum for this recipe – you’ll need to add that separately to make this cake work for you. Enjoy this super fun birthday cake at your next birthday party! I was just talking with a friend recently about how her husband still loves ice cream cake. I haven’t had one since I was a kid and seeing this recipe just brought me right back to childhood. Layers of dairy-free ice cream are stacked with gluten-free dairy-free chocolate sandwich cookies, and the whole thing is topped with coconut whipped cream. This one is super simple and great for the summer, because there’s no baking required! If you love strawberries, this gluten-free vegan strawberry cake is for you. Instead of strawberry jam or artificial flavoring, this recipe is made with fresh strawberry puree. This cake bakes up a beautiful pink color and if you want even more pink, you can add some natural beetroot powder for extra coloring. You don’t have to live without cake when you go gluten and dairy-free, and this recipe is proof. Swap the cake flour for a gluten-free version to make it 100% gluten-free and dairy-free. This vegan vanilla birthday cake promises to be fluffy and moist – even without the butter or eggs. To make this dairy-free cake gluten-free too, make sure to swap out the flour for a gluten-free flour blend. Now I have no idea what Carvel is, but assuming what I can from this post, it’s some amazing restaurant I’m missing out on. This ice cream cake is gluten-free, dairy-free, and made with chocolate cashew ice cream. This best gluten-free cake recipe is another tasty take on a classic yellow cake. Be sure to follow the directions on this one carefully – if you make any swaps, they might not turn out how you expect. This tasty vanilla cake is both dairy-free and egg-free, but you’ll need to make it gluten-free by swapping out the flour for a gluten-free flour blend. Make this one into cakes or cupcakes for a tasty and allergy-safe option for any birthday party or special event. This dairy-free and egg-free vanilla confetti cake is a great option for you if you’re gluten-free, dairy-free, and egg-free. You’ll need to swap out the flour for a gluten-free flour blend to make this one GFDF friendly. If you’re a fan of King Arthur gluten-free baking mix like I am, you’ll love this recipe. You get to use baking mix to make this gluten-free cake come together even easier. Just be sure to swap out the milk for a dairy-free milk to make it fully dairy-free. This gluten-free yellow cake with chocolate fudge frosting is moist and tender with a chocolatey fudge frosting. You can use this recipe to make a sheet cake, two round cakes for a layered cake, or cupcakes. To make buttermilk like this recipe calls for, be sure to use dairy-free milk instead of milk for a dairy-free buttermilk instead. This old fashioned yellow cake with chocolate frosting recipe offers three variations on a favorite recipe. The old-fashioned version, a paleo option, and a vegan option. Follow the vegan version of the recipe in order to make sure it’s truly gluten-free and dairy-free. This basic and versatile recipe is a great option when you’re wanting a classic yellow cake, but need it to be gluten-free and dairy-free. Be sure to swap out dairy-free milk for the regular milk called for in this recipe. These delightful gluten-free yellow cupcakes are made using Bob’s 1:1 gluten-free baking flour. To make this recipe dairy-free, be sure to use coconut milk (or other dairy-free milk) to replace the regular milk. This gluten-free dairy-free paleo carrot cake is a healthier version of your tried-and-true carrot cake. This recipe has no grains, no butter, no refined sugar, and uses coconut and cashews for the “cream cheese” frosting. This easy-to-make gluten-free vegan carrot cake is a lightly spiced cake with a dairy-free cream cheese. With nuts, carrots, and the optional pineapple, this is a cake you can easily talk yourself into being healthy. This vegan gluten-free carrot cake recipe is a take on another recipe by America’s Test Kitchen book “How Can It Be Gluten-free,” but Ali from Gimme Some Oven made a few tweaks to give it her own style. She adjusted the salt and spice amounts and swapped eggs for flax eggs to make it egg-free as well. This moist and fluffy gluten-free carrot cake isn’t dairy-free, but can be made to be easily by swapping out buttermilk for coconut milk with a splash of apple cider vinegar. Also swap the cream cheese for vegan cream cheese, and butter for coconut oil or vegan butter to make it work for your gluten-free dairy-free diet. These carrot cake cupcakes promise to be a little more on the healthy side than your traditional carrot cake. Erin from Texanerin, uses a mixture of coconut and almond flour coconut oil, and honey. This delicious gluten-free dairy-free carrot cake also is egg-free! Enjoy this yummy spiced cake loaded with carrots and a tangy cashew yogurt frosting (also dairy-free!) on top. This easy carrot cake recipe is made with a pound of fresh carrots, uses gluten-free flour, and all your favorite standard carrot cake ingredients like spices, vanilla, and eggs. Be sure to swap the butter for vegan butter and buttermilk for coconut milk plus a squeeze of lemon juice. This tasty carrot cake recipe is gluten-free and dairy-free, along with being moist but not too heavy. This recipe also uses a coconut frosting and vegan cream cheese to make it even more delightful. Healthy Carrot Cake Cupcakes are a secretly healthier version of your standard carrot cake recipe. These are dairy-free, egg-free, sugar-free, gluten-free, and are loaded with Vitamin A. Topped with easy dairy-free cream cheese, these cupcakes are a real treat. When you want to pretend you’re eating a healthy cake, carrot cake is probably the number one pick. This moist, rich, and delicious dairy-free carrot cake can easily be made gluten-free by swapping out the all purpose flour for a 1:1 gluten-free flour blend. These gluten-free vanilla cupcakes have no dairy, no eggs, and no nuts – for those of you who are on a strict nut-free diet. The decadent chocolate frosting in dairy-free too, so you know it’s going to be good for you and taste great too. This beautiful gluten-free dairy-free and vegan cake is topped with ombre chocolate roses. I don’t know that I could really make anything look as gorgeous as this cake, but just by following the recipe, I’m pretty sure I could make it taste just as good. This recipe spotlights Enjoy Life flour blend, which is allergy-friendly all around. Allergy-free vanilla cake is delicious and it gets loads of points for being egg-free, dairy-free, soy-free, peanut-free, and has gluten-free options. With just 8 ingredients, it’s simple and easy to put together. This go-to recipe for chocolate crazy cake is amazing, because it doesn’t need any eggs, milk, butter, bowls, or mixers. Say what? Yep, this recipe uses the reaction between baking soda and vinegar to give it it’s fluffiness, and the moisture comes in from the oil. Easy peasy. Okay, so cookie dough is one of my favorite ice cream flavors ever. Seeing this cookie dough brownie cake that is gluten-free and dairy-free had my mouth watering instantly. This recipe highlights Enjoy Life Foods, one of my favorite brands for gluten-free and dairy-free baking mixes and chocolate. Remember those little Hostess cupcakes you used to be able to buy when you were a kid (are they still around these days?)? This homemade version is a take on that – and even better, it’s gluten-free, dairy-free, and free from the top 8 most common allergens. Score! These delicious-looking vanilla cupcakes with vanilla frosting are bakery-style, gluten-free, dairy-free, egg-free, and nut-free. A winner all around, you definitely need to check this one out. 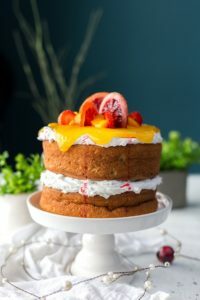 I’ve mentioned crazy cake before in this roundup, and here’s another delightful recipe featuring just a couple of ingredients to turn out an awesome cake. No gluten (swap flour with a 1:1 gluten-free flour blend), no dairy, no eggs – it’s a win-win-win! Check out Amazon’s baking tools & accessories here. Chocolate and hazelnut? You don’t have to convince me any further, I’m in. But the fact that this cake is not only gluten-free, dairy-free, and only needs one bowl really seals the deal. Give this one a try if you love moist chocolate cake and crunchy hazelnuts. This party-ready funfetti birthday cake is loaded with sprinkles and flavor. Gluten-free, dairy-free – and egg-free too if you’re avoiding eggs also. One of my favorite kinds of chocolate bars is dark chocolate with almond bits in it. That instantly makes this one a winner in my book – it’s gluten-free, dairy-free, and is loaded with chocolate and almonds. I’m gushing over how delicious this looks! I’d never heard of cherry and almond cake before finding this recipe, but boy does this one look delicious! This tasty cake is gluten-free, dairy-free, high in protein, and even has healthy fats! Coconut cake always reminds me of my wedding. We had our smallest layer of our cake as a coconut cake with coconut frosting – and we took the entire thing to our hotel after our wedding reception. It was delicious, and now I know if I ever want to relive that memory, I have a gluten-free and dairy-free version to turn to. As much as I don’t love mochas to drink, I do love coffee and mocha flavored other goodies. Like this mocha cake with vegan coffee buttercream… it looks divine and ticks all the checkmarks for following a gluten-free and dairy-free diet. If you love cake and hate messes, this one will be right up your alley. Just one bowl and you get a moist, fluffy, vanilla cake that is super easy to throw together. Better yet, it’s gluten-free and dairy-free so you can feel good digging into it! This chocolate orange cake is a match made in heaven – chocolate and orange together is divine. The best part of this cake is the frosting, which has a hidden healthy secret. You’ll want to click through to find out what that secret ingredient is! These gluten-free, dairy-free, egg free peanut butter chocolate cupcakes will melt in your mouth. Made with peanuts, peanut flour, dates, cocoa powder, and coconut oil – they’re a healthy and delicious treat. This lemon layer cake is a take on the “crazy cake” recipe I’ve shared previously in the post with no dairy or eggs. This one is made with lemon zest and lemon extract and the frosting is extra lemony with lemon extract and yellow food coloring. This tasty breakfast cake is flourless so you know it’s gluten-free. The frosting is made with protein powder, nut butter, and and dairy-free milk. Enjoy this light, fluffy, and healthy treat any time of day. This gluten-free and dairy-free vegan lemon poppyseed cake is made with Bob’s Red Mill gluten-free vanilla cake mix, applesauce, vegetable oil, the zest and juice of a lemon, and poppyseeds. It really couldn’t get easier! This gluten-free dairy-free lemon cake is made with just a handful of ingredients, and comes together quickly for a moist and flavorful cake. This gorgeous almond flour lemon cake is made with blanched almond flour, whipped egg whites, and a coconut whipped cream to go on top. Enjoy this one for any spring or summer holidays – or for no reason at all. Gluten-free vegan lemon blueberry cake is like made with fresh blueberries, not frozen (though those might work well too). This cake is easy to make and is topped with a simple dairy-free vegan cream cheese frosting. My husband used to love buying lemon pound cake at Starbucks years ago. I used to associate coffee and lemon cake together for the longest time – and here’s a wonderful gluten-free and dairy-free take on that old favorite. This traditional lemon and oilve oil cake is a new take on an old Italian favorite. Just be sure to swap the flour for a gluten-free flour blend to make it both gluten-free and dairy-free. Vegan lemon drizzle cake is perfect for any springtime get-together, but you could enjoy it year-round if you love lemon anytime like I do. This recipe drew me in, mainly because the syrup sounded so good – lemon and rosemary infused syrup in this cake? I’m in. Whenever I hear “flourless cake,” I always immediately think “well, what did they use instead of flour?” In this recipe, instead of flour, you can be sure it’s gluten-free, because they use almond flour (ground almonds) instead of traditional flour. This recipe is also dairy-free, so you can feel good about it making this one on your GFDF diet. True story – I’d never tried red velvet cake until just a couple of months ago (and yes, it was a gluten-free dairy-free version). I was pleasantly surprised by how much flavor the cake had despite it seeming like all it had going for it was the color. This tasty vegan red velvet cake is topped with a tangy lemon lemon buttercream that you’ll love. Be sure to use gluten-free flour in place of regular flour in this one. This beautiful gluten-free red velvet layer cake is gluten-free and dairy-free, perfect for Valentine’s Day or any time of year. This version of gluten-free dairy-free red velvet cake is much healthier than it’s old-fashioned counterpart. This one is made with dairy-free milk, apple cider vinegar, coconut oil, vanilla, salt, almond meal, and a few other pantry staples. Make this red velvet cake a gorgeous red color with natural beetroot powder. These gluten-free vegan red velvet cupcakes are a wonderful gluten-free dairy-free alternative to your standard red velvet cake or cupcakes. These ones use gluten-free flour blend, dairy-free milk, and even a dairy-free vegan buttercream frosting. Classic gluten-free red velvet cake is a moist, tender, and is a light chocolate flavor. This isn’t an overly sweet cake, but it’s frosting is pretty sweet so if you love a super sweet cake, load up on the cream cheese frosting. Be sure to swap out the milk for coconut milk, the cream cheese for vegan cream cheese, and butter for coconut oil or vegan butter. This light and fluffy gluten-free red velvet cake is made from 11 ingredients, including vegan-friendly red food coloring to help it live up to its name. Enjoy this cake with the dairy-free frosting made from dairy-free cream cheese, dairy-free butter, powdered sugar, and vanilla extract. This gorgeous red velvet cake is made from buckwheat flour, almond milk, coconut sugar, among other standard pantry staples. This one is gluten-free, dairy-free, and even refined-sugar-free, so you can feel good about this one while sticking with your GFDF diet. This tasty vegan red velvet cake is lovely topped with fresh blueberries and with its white frosting, gives it a red white and blue vibe. Be sure to swap out the all-purpose flour for a gluten-free 1:1 measure flour blend. This gluten-free vegan red velvet bundt cake offers a few new takes on this classic cake. First, it’s made in a bundt pan, and second, this recipe has a sticky marshmallow icing in place of a traditional cream cheese frosting. Even a little different, it looks amazing. This red velvet cake is gluten-free, dairy-free, vegan, and low-sugar so you know it’s going to leave you with a ‘my-belly-is-happy’ feeling instead of a ‘weighed down, gluten and dairy-inducing bloated mess’ feeling you might expect from cake. This recipe uses dairy-free white chocolate, which is a unique take on this classic recipe. This fluffy dairy-free chocolate frosting is a great go-to recipe if you want to frost your cake or cupcakes with chocolate. This recipe uses dairy-free margarine, like Earth Balance, hot water, cocoa powder, vanilla, and powdered sugar. I’m often asked how to make dairy-free frostings for cakes, and how to replicate something like a buttercream frosting without the butter or cream. Here’s your answer: dairy-free buttery spread like MELT, vanilla, salt, powdered sugar, and vanilla almond milk. Easy and delicious! Here is another dairy-free buttercream vanilla frosting made a different way – with dairy-free shortening instead of margarine. It’s made the same way and tastes just as good as the real thing! This vegan cream cheese frosting is dairy-free and is excellent for topping carrot cake, spice cakes, pumpkin cookies, or red velvet cakes. This frosting is made using Tofutti better than cream cheese spread, vegan margarine (like Earth Balance), powdered sugar, vanilla extract, and lemon juice. This dairy-free raspberry frosting is a beautiful pink color when put together. Perfect for any birthday cake or cupcakes, this recipe uses vegetable shortening, raw honey, vanilla extract, stevia concentrate, salt, almond extract, fresh raspberries, and water. Here’s another amazing dairy-free chocolate frosting – this time chocolate buttercream. This one uses dairy-free margarine, vegetable shortening, icing sugar, dairy-free dark chocolate (like Enjoy Life bars), cocoa powder, and vanilla extract. This tasty dairy-free and vegan frosting uses cashews for it’s body and base for any flavors you’d like. This recipe uses raw cashews, coconut oil, full fat coconut milk, honey, vanilla extract, salt, and lemon juice. Peanut butter frosting would be great over chocolate cupcakes or cakes, over even a vanilla cake with strawberry jam frosting (PB&J cake anyone?) This recipe is dairy-free and vegan and made from peanut butter, coconut oil, vanilla, powdered sugar, salt, and almond milk. Who would have thought of chocolate frosting being made from avocados? Not me, but it works in this recipe! Combine dark cocoa powder, avocados, maple syrup, coconut oil, vanilla and cinnamon for this tasty frosting. Even if you don’t make cakes all that often, I hope that this recipe roundup will find its way to your Pinterest board or even bookmarked somewhere for safe-keeping for when you’ll need it. You never know when you’ll have to get a birthday cake together or deal with a friend who has other food allergies or intolerances – and you can meet them where they are, without doing a ton of research. If you loved this recipe roundup, I’d love for you to share it on Pinterest and Facebook, or send it to a friend. And if you’d like to receive more information on going (and staying) gluten-free and dairy-free, you can get a free gluten-free dairy-free shopping list plus weekly inspiration and content directly to your inbox.